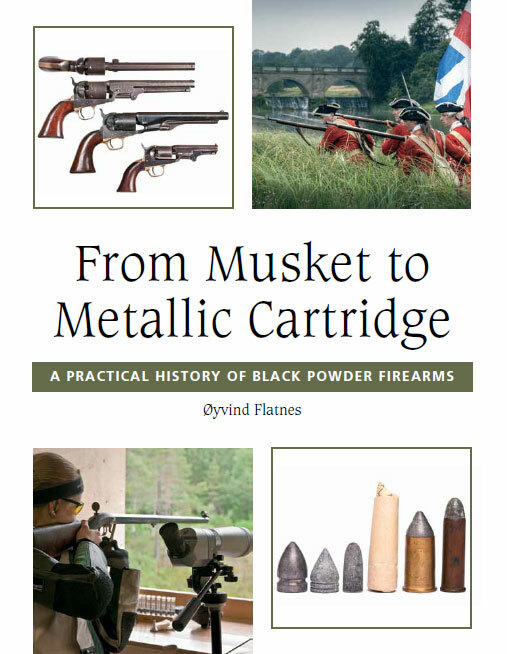 From Musket to Metallic Cartridge is an historical introduction to the use of black powder firearms, from the primitive smooth-bore musket to breech-loading cartridge guns, as well as a primer on their practical use for today's black powder shooters. Learn more about the book's 20 chapters below. Tip: Use the left-hand menu to browse for a chapter of interest. 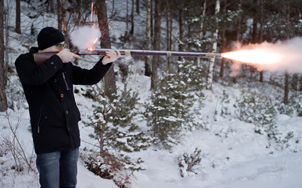 The invention of black powder revolutionised weaponry in the late Middle Ages. 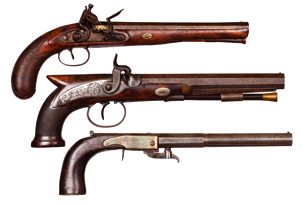 While the black powder remained almost the same throughout the years, the firearms gradually developed from simple hand held pipes without stock or lock to rapid-fire machine guns. 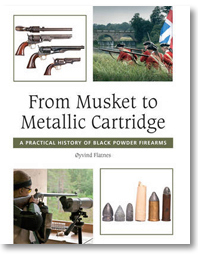 Whereas other chapters focus on specific models or systems, this chapter is presented as an overview of the technical evolution of firearms and black powder over the course of 500 years, intended to serve as a basis for the following chapters. The development of firearms has always been boosted by major military conflicts. During the medieval time, armies usually clashed together in closely packed formations. At Waterloo in 1815, the infantry marched shoulder to shoulder in thin lines until face-to-face with the enemy, halted and fired their muskets simultaneously into the advancing formations. The battlefield tactics gradually changed as the firearms technology progressed from primitive, inaccurate smooth-bore muskets to the accurate metallic cartridge rifles, but military commanders were slow in adapting – a prime example being the American Civil War. 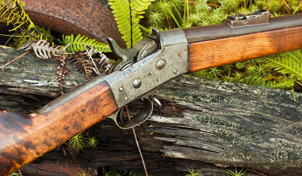 Flint and percussion locks are the most common muzzle-loading ignition system among today's black powder shooters, and the matchlock is increasing in popularity. Many of the remaining chapters describe different types of muzzle-loaders, and to avoid any repetition this chapter describes the practical use of matchlocks, flintlocks and percussion locks. 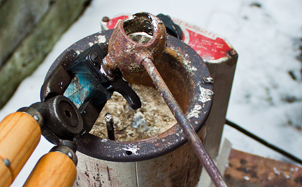 You will learn to prepare matches, sharpen flints, select percussion caps and priming powder, speed up ignition – simply make the most out of your lock. 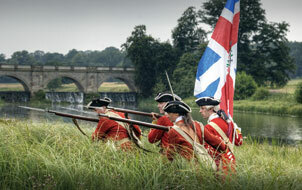 Although considered inaccurate by modern standards, the smooth-bore musket was used in practically all armies from the early 1600s to the mid-1800s. Many civilians preferred them too because of their ability to combine ball and shot. By looking at French, American, English, Norwegian, Danish and Swedish military muskets, you will learn how to make different types of musket ammunition and load the musket with paper cartridges, or 'naked' or patched roundballs. Compared to the smooth-bore musket a muzzle-loading rifle loaded with a patched roundball is more accurate, but slower to load. The rifle was therefore deemed too complicated for general military issue, but rifles were used in limited numbers by special units such as jaegers, skirmishers and light infantry. 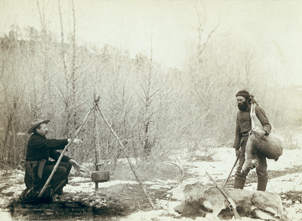 Civilian hunters used the muzzle-loading rifle efficiently on all sorts of game – from squirrels and rabbits to moose and buffalo. As well as learning about the history of European and American rifles, a practical section shows you how to find the correct sized ball, select the best patch material and determine correct patch thickness and lubricate it. 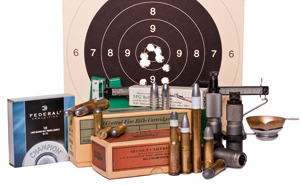 Then you will learn how to load patched roundballs for match accuracy in muzzle-loading rifles. Developed in parallel to the longarms, the muzzle-loading pistols were used by cavalry, officers, post riders, highwaymen and pirates. With the exception of cheap pocket handguns, pistols were less common in the hands of common civilians. The aristocracy however furnished themselves with expensive target shooting pistols – often made in pairs and, sometimes incorrectly, labelled ‘duelling pistols’. While the military pistols were big and heavy, the civilian target pistols were well-balanced and accurate. Today, many competitive black powder shooters enjoy shooting the muzzle-loading pistol – some of which can be extremely accurate. The chapter contains loading data for a number of pistols and calibres that can be used for developing your own accurate load. By far the most common handgun among today's black powder shooters, the revolvers carried by soldiers in the American Civil War were almost exclusively percussion, or cap and ball, revolvers. While the percussion revolver is best known for its role in the American Civil War, it was also used in the opening of the American West and in the Crimean War in Europe. You’ll learn about the most common models made by Colt, Remington, Rogers & Spencer, Adams – and Tranter and of course how to load, shoot and clean these early revolvers. The trade-off between the reloading speed of the smooth-bore musket and accuracy of the muzzle-loading rifle continued until the invention of the Minié ball in the late 1840s. Named after French Captain Claude Etienne Minié and known for its deadly role in the Crimean War and American Civil War, the conical hollow-based Minié ball was fired from the new, modern rifle musket, which was similar to a smooth-bore musket, except for a rifled barrel and smaller calibre. Although the accuracy of the rifle musket and Minié ball can be outstanding, it may be challenging to make it shoot accurately. However, after reading this chapter you should be able shoot apple-size groups at 100m. A favourite of Confederate sharpshooters during the American Civil War, the Whitworth rifle was the perfected muzzle-loading rifle. 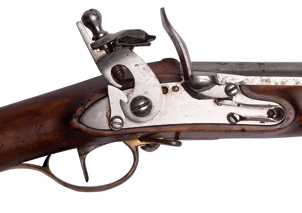 Made only years before breech-loaders replaced the muzzle-loaders, it combined the best of what was developed during hundreds of years of muzzle-loading technology. 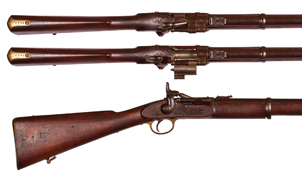 Then and now, the Whitworth rifle and other similar ‘small bore’ percussion muzzle-loading rifles, such the Metford-Gibbs, Kerr and Rigby, are the most accurate muzzle-loading firearms available. With the correct load and bullet a long range muzzle-loading shooter should be capable of 1 inch groups at 100 yards, and 30 inch groups at 1000 yards. While muzzle-loaders had to be loaded upright, the various breech-loading systems allowed soldier to load while lying down. The chapter describes the history and practical use of the Norwegian kammerlader, the Prussian Dreyse needle-gun, French Chassepot and briefly discusses British capping breech-loading rifles and carbines, such as the Westley Richards 'monkeytail' and Calisher and Terry. The main focus is on the distinctively Norwegian underhammer capping breech-loader ‘kammerlader’, or ‘chamber-loading' rifle. Adopted in 1842 by the Norwegian Army, it was the first breech-loading rifle in the world to be issued to an entire army. The large-calibre single shot black power rifles, such as the Model 1874 Sharps, Remington rolling block, Springfield Trapdoor and Martini-Henry were powerful and accurate firearms – even by modern standards. Today, original single shot cartridge rifles are used by thousands of black powder shooters across the world. As well as describing the main models of the Swedish and Norwegian Remington rolling block rifles and the Sharps, Springfield Trapdoor, Snider and Martini-Henry rifles, this chapter also shows you how to load cartridges for some of the most common obsolete European single-shot cartridges, including 12mm Remington, .577 Snider and .577/.450 Martini-Henry. 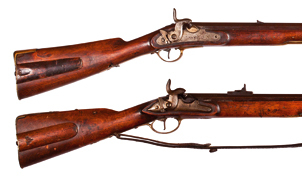 Spencer, Henry and Winchester repeating rifles are known to all black powder shooters, but the first powerful military repeating rifles were developed in Europe. In 1876 the Norwegian Navy adopted the Krag-Petersson rifle with a ten round capacity tubular magazine under the barrel, and the Norwegian Army adopted the 10.15mm Jarmann rifle in 1884 – today regarded as the world’s first military bolt action repeater. 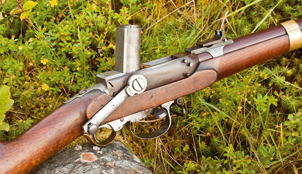 We’ll take a look at the history and practical use of the early repeating rifles from Spencer and Henry, via Winchester lever action and Colt pump-action rifles, to Jarmann and the German 11mm Infanterie-Gewehr 71/84 or Mauser 71/84. 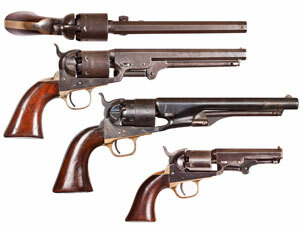 The period referred to as the ‘Old West’ produced many legendary revolvers: Colt…Smith & Wesson…Remington... The list goes on and on. 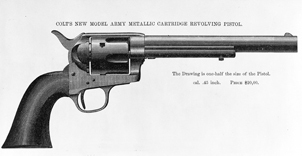 In America, thousands of the percussion revolvers used in the Civil War was converted, but soon pure metallic cartridge models started to appear, with the most famous being the Colt .45 Single Action Army – known as the Peacemaker. You’ll learn about the history of the American cartridge revolver, as well as European revolvers, such as the Lefaucheux, Nagant and Webley. Paper patched bullets were used in percussion muzzle-loading rifles and black powder cartridge rifles from the mid-1800s. Famous rifles that used paper patched bullets include the .577 family of Enfield rifle muskets, the Whitworth rifle, the .577/.450 Martini-Henry, the German 71/84 Mauser, Swiss Vetterli, Norwegian Jarmann, as well as numerous civilian target and hunting rifles. Some revolver rounds even used paper patched bullets, such as the Norwegian and Swedish 7.5mm Nagant. 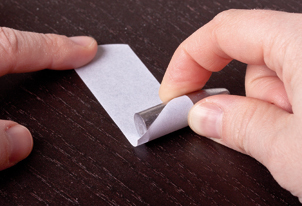 After reading this chapter you will be capable of paper patching your own bullets. Anyone who appreciates the six-gun or classic single-shot or repeating rifles of the late 1800 period should know how to load black powder cartridges. Black powder cartridges can be reloaded both with and without the use of reloading tools, and the accuracy can be superb with both. The chapter describes the basics of reloading pinfire, rimfire and centrefire black powder cartridges, and the most common cartridges are described in detail with recommended loads – from the pistol size cartridges to the big rifle cartridges. The use of shot in firearms is probably as old as the firearms. A cannon, musket, or pistol loaded with lead shot, scrap metal, or even pebbles, could prove more efficient on short ranges compared to a single lead or iron ball. 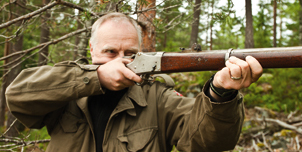 As time went by, purpose-built shotguns were developed and used for hunting, self-defence or clay shooting. This chapter covers the history and use of the shotgun – from muzzle-loader to pump action shotguns. Learn how to load muzzle-loading shotguns for hunting or clay, load your own black powder shot shells and how to make your own shot. 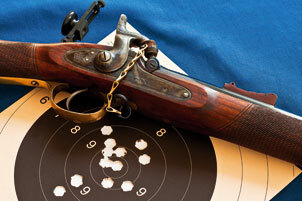 How do you work out a load for your black powder firearms? When you’ve found an accurate load you probably need to adjust the sights horizontally and vertically to hit the bull's-eye. With adjustable sights the job is easy, but fixed iron sights can be challenging. This chapter describe different sights – from primitive open sights to early telescopic sights, as well as how to adjust them on target. You also get tips on trajectories, how to find the best load and how to clean black powder firearms. Most firearms described in this book are oddball calibres that shoot bullets that are now long obsolete. That's why most black powder shooters cast their own bullets. A proper technique is required to get perfect bullets, and after learning how to take proper safety precautions, you'll get a primer on how to melt the lead, make alloys, prepare the moulds and cast the bullets. The bullets need proper lubrication before shooting. While there are a range of lubrication products available, you can make your own with readily ingredients. This chapter shows you how. Hunters in different parts across the world – from Norwegian bear and reindeer hunters to English big game hunters and American bison hunters – used black powder firearms with telling effect in the 16th and 17th centuries. The hunting guns changed over time: early buffalo hunters, for example, chased the animals down on horseback, but when the powerful, long-range rifles were invented a hunter could kill the buffalo from a fixed position. 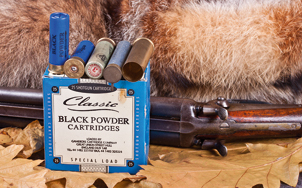 A practical part for the modern black powder hunter discusses the basic difference between black powder and modern hunting rifles and the pros and cons of different bullets. The worldwide society of black powder shooters is diverse, and consists of many different organisations and communities: competitive shooters, hunters, collectors, Cowboy Action Shooters, NMLRA, MLAIC, re-enactors, recreational shooters, gun builders and skirmishers. This chapter presents the people of the black powder community. This appendix contains a selection of the most important sources and literature used in the creation of the book.